BitLife – Life Simulator – How To Become An Actor? The answer to this question is pretty simple; all you need to do is apply for Voiceover Actor job in any company and work there for a few years. 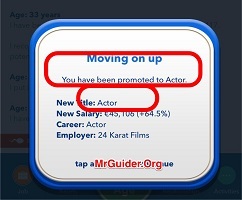 You will instantly get the Actor achievement as soon as you get approved for Voiceover actor job. After working as a voiceover actor for a few years, the company will promote you to the next title; that’s Actor and then lead actor. 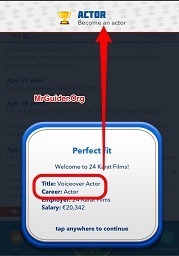 To get approved for the right job(Voiceover actor), there are some things you need to know, which we have mentioned in today’s BitLife – Life Simulator walkthrough – How to become an actor in BitLife? Start With A Good Looking Character! Stats such as looks, smartness, happiness, and health matter a lot. If you want to become an actor, make sure to start with a good looking character. Just after you start a new life, check the virtual character’s looks stats. If it’s over 85, head to the second part of this walkthrough. If not, we would recommend you to start a new life(tap the menu button at the upper right corner -> start a new life). Continue with the character having good looks. Well, the educational qualification of the character does not really matter. But, we would recommend you to go for one of these education careers at the university; Arts, Political Science, Dance, and Music. After getting an undergraduate degree in one of the above-mentioned subjects, you can seek higher education in schools(i.e. Graduate School). But it does not matter. As we mentioned above, to become an actor in BitLife, you need to apply for Voiceover Job. If you have good looks or smart stats + happiness, you will get approved instantly. If not, then you should start strong with a good looking character(As mentioned in the first tip). Now, another problem that you might face is the Job Listings. After getting a degree from the university, you will have to apply for a job to make a living. Since you want to become an actor, Voiceover Actor is the way to enter into the actor career. But there is no guarantee that there would be a vacancy in Voiceover Actor slot. If there is a vacancy available, apply for it. If not, then wait until you see that job in job listings. 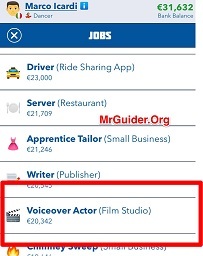 All you need to do is tap the age button -> then occupation/job -> check the Jobs/Job-listings(every year) and look for the Voiceover actor job. It will appear eventually. Meanwhile, you can apply for a job like a Dancer or Artist(if you want. If not, check job listings every year). So this is the complete BitLife – Life Simulator walkthrough guide to becoming an actor. If you know any other method, don’t forget to share with other fellow players in the comment section below! Yep, you don’t need to work hard if your smarts stats are good. If not good, then you should try working hard every year. @Anonymous As long as your all stats are good, you don’t need to do this. But it’s always a best practice to make use of these activities every year. I need help. I’ve been trying to get the actor achievement for a while now, using different characters every time. It NEVER allows me to become an actor. I’ve tried with 100% looks with a degree in music, 85% or more looks with a degree in arts, and 100% looks with no degree, and it’s never allowed me to become an actor. It’s making me mad.